Review by AllTheBestFights.com: 2019-02-09, pretty good fight between Jo Jo Diaz and Charles Huerta: it gets three stars. The former Olympian Joseph Diaz entered this fight with a pro boxing record of 27-1-0 (14 knockouts) and he is ranked as the No.9 featherweight in the world (currently the #1 in this division is Leo Santa Cruz). He fought three times last year beating Victor Terrazas (Joseph Diaz vs Victor Terrazas) and Jesus M Rojas (Joseph Diaz vs Jesus M Rojas) but between these two bouts he suffered his first and only loss, against Gary Russell Jr (Gary Russell Jr vs Joseph Diaz). His opponent, Charles Huerta, has a record of 20-5-0 (12 knockouts) but he is not ranked as he hasn’t fought since August 10, 2017 when he defeated Miguel Angel Gonzalez; before this bout he had also beat Ivan Delgado while in 2016 he had lost to Carlos Morales. 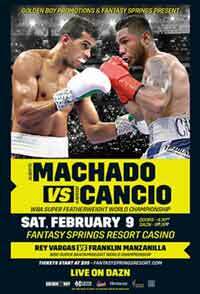 Jo Jo Diaz vs Huerta is on the undercard of Alberto Machado vs Andrew Cancio. Watch the video and rate this fight!